Kevin Durant looks to nudge past Kobe Bryant and collect his third scoring title in one of the closest races in NBA history.One of the closest scoring races in NBA history comes down to the final day of the season, as Kevin Durant and Kobe Bryant each take aim at their third scoring title. The Oklahoma City Thunder lost to the Denver Nuggets on Wednesday to finish the season at 47-19. That .712 winning percentage is the best for the franchise since 1997-98, when the Seattle SuperSonics finished 61-21 – a .744 clip. Durant scored 32 points in the loss, and finished the season with 1,850 points in 66 games. That computes to 28.03 points per game, so he is currently in position to claim his third straight scoring title. However, Bryant and the Los Angeles Lakers finish their season on Thursday against the Sacramento Kings. 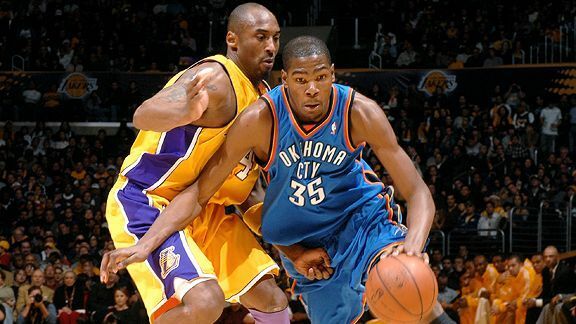 With 38 points, Bryant would pass Durant to claim his third scoring title and first since the 2006-07 season. If Bryant wins the scoring crown, he would be the first player over 30 years of age to lead the league in scoring since Michael Jordan in 1997-98. Bryant has scored at least 38 points in seven of his 58 games this season. In two games against the Kings, he has netted 29 and 38. This is one of the closest scoring races in recent NBA history. Two years ago, Durant claimed his first scoring title by 0.44 points per game over LeBron James. The closest scoring race since 1968-69 took place during the 1977-78 season, when George Gervin finished 0.07 points per game ahead of David Thompson. If Bryant finishes with between 34 and 42 points against the Kings, this season would vault to the top of the list. With their 102-95 loss to the Orlando Magic, the Charlotte Bobcats are one loss away from recording the worst win percentage in NBA history. The Bobcats host the New York Knicks on Thursday with a chance to avoid the dubious distinction. The current record holder is the 1972-73 Philadelphia 76ers, who finished the season with a .110 winning percentage after winning just nine of 73 games. If the Bobcats lose to the Knicks, they’ll have a 7-59 record and .106 win percent. The Bobcats have lost 22 straight games since beating the Toronto Raptors on March 17. That’s the fourth-longest losing streak within a single season in NBA history. The Cleveland Cavaliers lost 26 straight games during the 2010-11 season. With a loss Thursday, the Bobcats would tie the 1995-96 Vancouver Grizzlies and 1997-98 Nuggets for the second-longest streak. • The Los Angeles Clippers finished their season with a 99-93 loss at the Knicks. They ended up with a 16-17 road record. According to the Elias Sports Bureau, the Clippers have never finished with a .500 or better record on the road in their 42-year franchise history. • Evan Turner scored a career-high 29 points as the 76ers beat the Milwaukee Bucks, who were led by the first career double-double for Tobias Harris. • The Washington Wizards won their fifth straight game, the longest winning streak for the franchise since they won six straight games in November 2007.